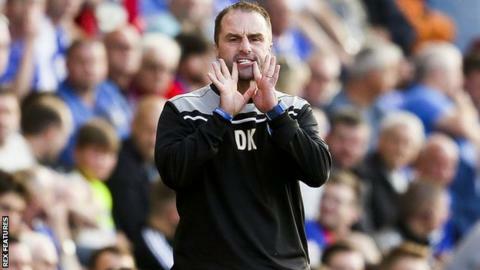 Darren Kelly's only win as Oldham manger was a 1-0 victory over managerless Fleetwood in August. National League side Halifax Town have appointed former Oldham Athletic boss Darren Kelly as their new manager. Kelly was dismissed by the Latics in September after just four months in charge of the League One side. The 36-year-old has signed a contract until the end of the current season, with an option to extend the deal for an undisclosed period. "This is a fantastic opportunity and I am excited about the challenge we have ahead," Kelly told the club website. The Shaymen had been without a manager since dismissing Neil Aspin on 17 September, having taken five points from their opening 10 fixtures. Kelly won just one of his nine games in charge of Oldham before he was replaced by Grant McCann following a defeat by Peterborough. The former Derry City, Carlisle United and York City defender had been appointed Latics manager in May, following a spell as a coach at Sunderland. Halifax are on a six-match winless run, and sit 23rd in the National League with seven points from 13 games.